Recently you might have spotted me dashing around town in the brightest blue sedan that Los Angeles has ever seen. 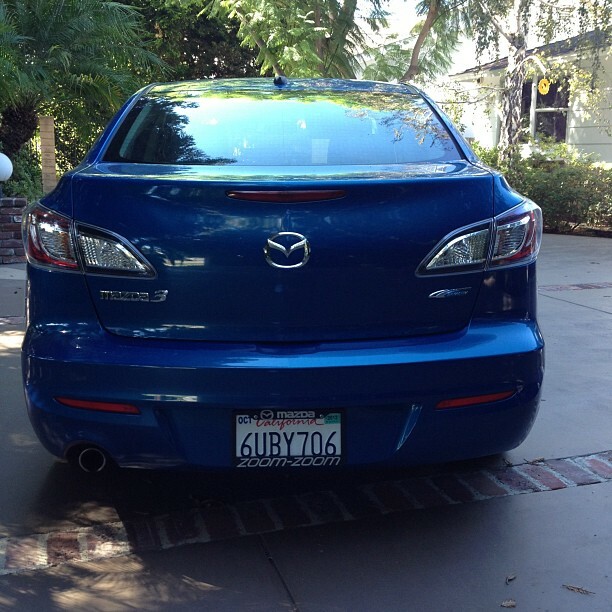 The 2012 Mazda 3 sips gasoline and gets you where you want to go comfortably. It’s a small sedan and parking is a breeze but there’s still enough room so that the boy around the corner who we carpool with can fit comfortably in the back seat. He’s five feet eight inches tall. This is impressive. 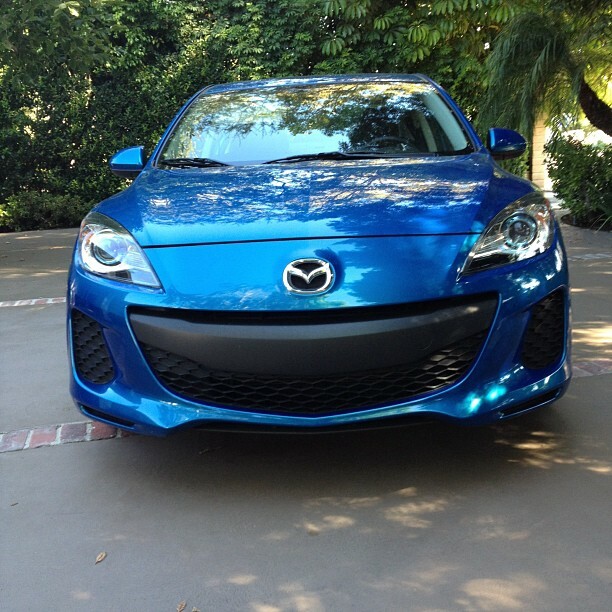 The Mazda 3 is for a very particular type of automotive buyer. You’ve got to want a sedan and be in a sort of starting pricepoint. The model I drove was stickered at $24,970 and had everything you could want in a car including a technology package that has a blind spot monitoring system. I’ve seen the blind spot system in Ford vehicles so I suspect that’s a holdover from when Ford had a stake in Mazda but it’s one of the features I love most in our Jaguar and I appreciate any sort of accident avoidance that a manufacturer can offer. Speaking of which I like that the Mazda 3 has a five star rating for the driver. I’m okay with the four star crash rating for the passenger but I’d really like to see what the crash ratings are for side impact. My window sticker says that they’re not available yet but I’ll update this post when the car has been tested. Everyone I love most sits in the back seat. When I drive cars in this range I think of young drivers or new families and I’m thinking of two things: comfort and safety. Is the Mazda 3 comfortable? Absolutely. Five adults might be a bit of a crunch but there’s plenty of room for three kids in the back seat, big kids too. Is it safe? I think so. I felt good about piling the kids in. It’s a well thought out vehicle that respects both driver and the passenger and it’s really quite lovely to look at too.